NAB Show Virtual View, the first virtual extension of the NAB Show in Las Vegas, will be launched live May 12. 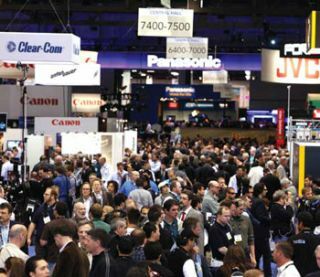 The event will feature exhibitor demonstrations, interviews, and booth tours, as well as live interactive video chats with industry experts on important discoveries that emerge from the NAB Show. NAB Show Virtual View will also include live keynotes of original content, and select recorded sessions from the show itself. NAB Show Virtual View, NAB’s first official online forum, was designed to facilitate dialogue and the exchange of new ideas regarding the latest developments coming out of the NAB Show and their impact on the content business community. NAB Show Virtual View was created in partnership with InXpo and Freeman, the NAB Show general contractor and AV provider. The event is free to attend. ■ Video showcases from participating companies, as well as the ability to download collateral materials such as white papers, brochures, product/services information, and case studies. ■ Live video chats with industry experts on key discoveries from the NAB Show. ■ Original sessions in the auditorium discussing the “show effect” and their business projections based on new information gleaned from the NAB Show. ■ On demand access to the most popular breakout sessions from the NAB Show. ■ A social media component enabling seamless exhibitor and attendee engagement. The Axient wireless microphone system can automatically change frequencies, undetected by the user, to avoid interference. The system employs several new technologies that work together to deliver interference-free audio. Features include interference detection and avoidance, frequency diversity, ShowLink remote control, and more. Yamaha Commercial Audio Systems and Dan Dugan Sound Design launch the Dugan-MY 16 card for current model Yamaha digital mixers and processors including Yamaha 01V96, DM 1000, 02R96, DM 2000, M7CL, LS9, DSP5D, PM 5D, and DM E24/64N. Dan Dugan Sound Design automatic mic mixing products eliminate cueing errors, reduce feedback and ambient noise pickup, allow for smooth transitions between talkers, provide consistent system gain no matter how many mics are open, have the ability of handling up to 64 live microphones, and can be remotely controlled. The HME DX Series family of digital wireless systems balances superior wireless performance in the 2.4GH z band with simplified user operations, all provided in compact, ergonomic designs. At NAB, Clear-Com will introduce the newest member of the HME DX Series family, the HM E DX210. Based on the HM E DX200, the DX210 is available in a single- or two channel wireless intercom configuration that offers the same reliability and ease-of-use as the DX200, with additional functionality. The DX210 supports up to 16 full-duplex and 44 half-duplex beltpacks and/or wireless headsets by linking four base stations, and more flexible capabilities. The DX210, as do all DX Series systems, features Spectrum-Friendly Technology to avoid frequency conflicts, digital 64-bit encryption to prevent unauthorized users and Digital Frequency- Hopping, Spread Spectrum (FH SS) technology for interference-free communication. A dual-element condenser microphone designed for stereo recording, the AT2022 features two unidirectional condenser capsules in an X/Y configuration pivot to allow for 90-degree (narrow) or 120-degree (wide) stereo operation. The capsules also fold flat for storage and transportation. It is designed for general stereo recording, as well as field sound capture. The microphone includes a 1.6-foot cable terminating in a three-pin XLRF -type and a 3.5mm connector. The output of the microphone is a three-pin XLR connector. The 8260A Tri-Amplified DSP Monitoring System links mechanical, acoustical and signal-processing designs closely together. The 8260A features advances in audio driver technology, integrated with a sophisticated enclosure design, and Genelec’s Minimum Diffraction Coaxial (MD C) Mid/High driver technology. The coaxial driver design provides accurate imaging and improved sound quality, both on the acoustical axis as well as off-axis. The smooth frequency response leads to clarity and definition of the inner details of the audio. The 8260A combines a coaxial driver (MD C) with a modern waveguide technology (Genelec’s Directivity Control Waveguide/DCW), ensuring that drivers couple coherently over their full operating bandwidth, as well as creating a coincident mid-frequency/high-frequency point source. Based on PESA’s DR S Audio Distributed Routing System, the new Cheetah DR SEARS is a third-generation system that can now be configured up to 6144 x 6144 and beyond. The system removes the boundaries between mixed signal formats, and doesn’t just route content, it delivers it anywhere and any way. Cheetah DR SEARS allows users to integrate AES/EBU, analog audio, MADI and time code all within one distributed system. By allowing up to 128 inputs or outputs to be placed in different locations, systems can be built to maximize efficiency in cable management. Using Gig-E for data packet distribution, an input frame and output frame are connected up to 300-feet away from the main processing frame using only one RJ -45 cable or miles away using a single fiber-optic connection. The EARS Data Exchange Engine (DXE) supports up to 24 ports in 1RU . Dolby Digital Plus is moving the 7.1 surround sound experience from the cinema to the living room. The system powers up to 7.1 channels of discreet audio on televisions, streaming media, and portable devices. Filling the gap left by the CRT, Dolby Professional Reference Monitor (PRM -4200) is capable of accurately displaying the full dynamic range, contrast and color gamut delivered by leading-edge digital cameras and film stocks. Dolby Volume and loudness technologies answer consumer and operator concerns about loudness variations at every point in the broadcast chain. Apantac is demonstrating its new Tahoma-DL ‘hybrid’ multiviewer and its new Tahoma-Mini-Q video quad-split multiviewer at the NAB Show. The Tahoma–DL combines monitoring multimedia and broadcast quality inputs on the same multi-image display processing system. Apantac is rolling out six Tahoma-DL models during 2011.